Multiple studies in multiple countries covering multiple decades with multiple research groups using multiple research models and multiple funding sources have found no link between vaccines and autism, and the studies that I will quote here to demonstrate this are just a small selection of the huge amount of work that has been done. To offer an explanation of a complex scientific concept, that is, to try and disprove something, I will break the answer down into several parts. Why do people think there is an association in the first place? What do epidemiological studies reveal about any possible correlation between vaccination and autism? Is there a plausible and realistic mechanism by which vaccines could cause autism? 1. Why do people think there is an association in the first place? A child’s autism often becomes apparent to families, and is subsequently diagnosed, when a child is at an age that they are also getting their routine vaccinations. There is therefore said to be a temporal (related in time) relationship between a diagnosis of autism, and vaccination. Two things may occur close together in time because of co-incidence (known as correlation), or one may be caused by another (causation). The fact that there is a temporal relationship in this case has been clearly shown to be a coincidence (correlation), not causation, and extensive studies involving hundreds of thousands of children proving this will be discussed later. It may be that getting a vaccination is one of the first times a child with autism has a noxious stimulus (as safe as vaccines are, needles can still hurt a bit), and as such, it may be the first time that their intolerance of unpleasant sensations has been triggered. A mild fever and feeling generally unwell is also common after vaccination, and may also be enough to unmask the previously hidden signs of atypical, autistic, neurodevelopment. Since the 1980s, there has been an increasing number of children diagnosed with autism world wide, at the same time that the number of diseases protected for by vaccination is increasing. Again, this has been shown to be a coincidence, and in fact, although the total number of vaccinations has increased, the total antigenic load of those vaccines has decreased. The rise in the diagnosis of autism is as much to do with the increasing numbers of vaccines as it is to do with things like the increasing popularity of organic food, or channels available on TV. In other words, all these things are increasing, but autism is not caused by any of them. The increase in incidence of autism is thought mostly to do with an increased awareness of the disorder by the health care providers and the general public, and a change in diagnostic criteria. Here are two studies (1, 2) looking at reasons behind the apparent increase in the incidence of autism. A (now thoroughly debunked and officially retracted) study of 12 children by Andrew Wakefield published in 1998 was widely reported by the mainstream media as showing a link between bowel disease, autism and the measles-mumps-rubella (MMR) vaccine. However, this study which reported on only 12 children has since been proven to be a fraud, and Mr Wakefield has been stripped of his right to practice medicine (he has been taken off the medical register). Three of the children did not have autism at all; five had developmental concerns before MMR vaccination; behavioral symptoms developed in some children months (rather than days) after MMR vaccination; and colonoscopy results were altered from unremarkable findings to “nonspecific colitis”. In addition, patients were recruited through an anti-MMR organisation and the study was commissioned and funded for by planned litigation (including Andrew Wakefield himself being paid >450,000 GBP). Ten of the 13 authors of the study published a statement retracting its interpretation in 2004, and the Lancet fully retracted the paper in 2010. For more information about Wakefield’s fraud have a look here. 2. What do epidemiological studies reveal about any possible correlation between vaccination and autism? The incidence of autism among vaccinated and unvaccinated children was compared in a study of ALL children born in Denmark between January 1991 and December 1998. Among the 537,303 children, 838 (<1 percent) had autism or autism spectrum disorder (ASD), and 82 percent had received the MMR vaccine. There was no statistical difference in the incidence of ASD between the vaccinated and unvaccinated children. In addition to the lack of association between MMR vaccine and autism/ASD, no association was found between the age at the time of vaccination, the time since vaccination, or the date of vaccination and the development of autism or ASD. After the introduction of the MMR vaccine in Finland in 1982, a countrywide surveillance program was established to determine the incidence and nature of serious adverse events. Among the 1.8 million children who received the vaccine between 1982 and 1986, there was no clustering of autism related to MMR administration, nor was there an increase in cases of encephalitis or aseptic meningitis. Amongst the 31 children who reported gastrointestinal symptoms after the vaccine, no cases of ASD were reported or identified; and the mean follow-up was 9.25 years. In a total population study in Yokohama, Japan, the incidence of ASD among 31,426 children born between 1988 and 1996 increased from 48 to 117 cases per 10,000 children. The increased incidence in ASD continued to occur despite the MMR not being used after 1993. In another population study, bowel problems and developmental regression among 473 children with autism or ASD were examined between 1979 and 1998, and related to MMR vaccine (which was introduced in 1988). The proportion of children with bowel symptoms or developmental regression did not change after the introduction of the MMR vaccine. In addition, the rates of bowel problems and regression among children who received the MMR vaccine before their parents were concerned about their development were similar to the rates among children who received the vaccine after their parents were concerned about their development, and those who did not receive the vaccine at all. 27,749 children were surveyed, and no association between pervasive developmental disorder, thimerosal, or the MMR vaccine was found. In Denmark, 956 children were diagnosed with autism during the period from 1971–2000. There was no trend toward an increase in the incidence of autism during that period when thimerosal was used in Denmark (until 1990). From 1991 until 2000 the incidence of autism increased and continued to rise, despite the fact thimerosal had been removed from vaccines. 3. Is there a plausible and realistic mechanism by which vaccines could cause autism? Many potential biological mechanisms that have been studied and include; autoimmunity, the presence of persistent measles virus, damage to the intestinal lining allowing neurotoxic proteins to enter from the gut, whether thimerosal is a direct neurotoxin, and if vaccines can overwhelm the immune system and cause damage in that way. The study of biological mechanisms is immensely complex, and requires more than a high school knowledge of physiology, chemistry, molecular biology and immunology. There has also been so much work done as to make it impossible to summarise here, in plain English, for a lay audience. Here is one summary article as a place to start if you wish to examine the specific evidence more closely, but the conclusion of this vast body of work is that no evidence to support a biological mechanism has been found. In addition to individual studies excluding a link between autism and vaccinations, multiple systematic reviews (“super studies” that combine the results from many other high quality studies) such as this one have failed to find support for an association between vaccination and autism/ASD. In scientific language, one can never say something has been dis-proven, but as far as this issue goes, the evidence is a strong as it is possible to be. 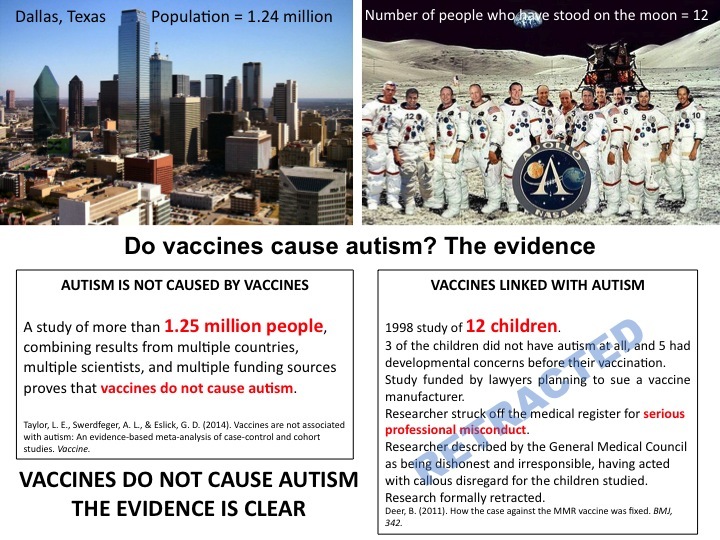 Rather than listing all the studies looking at possible links between autism and vaccinations here, I thank our friends Allison Hagood and Luci Baldwin (the authors of ‘Your babies best shot’), and Kathy McGrath and Nathan Boonstra for this link to 107 examples of published and peer reviewed research.